Awhile ago I found Meyer Lemons at the store. To be honest I didn't even really know what they were (besides the obvious lemons, of course), but somehow knew they were special and slipped a package of 8 into my shopping cart. Once they were home with me, it was all what do I do with these things? I can't just make any old lemon item, I have to make something special. Something decadent. Something worthy. Twitter offered all sorts of great suggestions, and at first I settled on a lemon vinagrette and marinade for a prawn salad. Good, but not quite what I was thinking of. Scouring the internets some more ideas, I finally stumbled across David Lebovitz's blog and his post about improved lemon curd. At first I was a little skeptical. 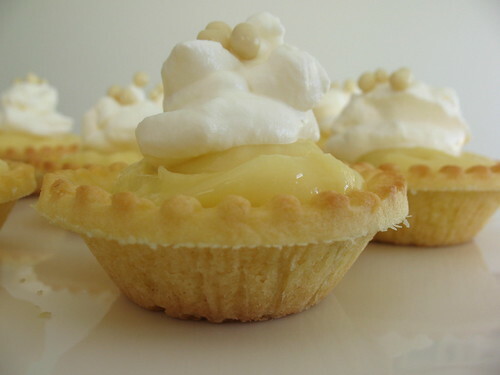 I've never enjoyed lemon meringue pie, with all that foamy meringue perched a top tart lemon stuff. Meh. As I read, the post drew me in and suddenly, all I could think of was creamy, tart, lemon curd. I had made curd before, but it was never that great, and now I know why. I used *gasp* bottled lemon juice, once. Never, ever do that. The next time, I didn't press the mixture through a strainer. Don't skip that step. As much as you whisk, you will get little bits of cooked egg white in your curd. The strainer weeds those babies out and leaves you with a perfectly smooth concoction, which is what you are going for. Before you do anything else, put a mesh strainer over a bowl or in my case, a big 4 cup pyrex measuring cup. In the top part of a double boiler over simmering water, whisk together the lemon juice, sugar, eggs, and salt. Add the butter cubes and continue to whisk constantly over low heat. The whisking is the trick to truly creamy, smooth curd-it keeps the bits of egg from cooking and floating around in it. Whisk away over low heat, and the butter will eventually melt, even though at times it will seem to clump up and try to drive you crazy. Once the butter melts, increase the heat to medium and continue to whisk constantly. The mixture will suddenly thicken up into a thick pudding-like consistency, and you'll know it's finished when you lift the whisk from the mixture, and the mixture "holds it's shape when it falls back into the saucepan from the whisk". Immediately remove it from the stove and pour into the strainer, forcing it through by pressing with a spatula. That's when any little bits of egg white that globbed together will be weeded out of your delicious curd. Transfer to a jar, seal, and keep in the fridge for up to a week. You can spread it on toast or crumpets, use as a filling for cake, eat by the spoonful, or make lemon tarts like I did. Now I'd love to say that I made those tart shells from scratch, but I didn't. I bought them. Then I pricked them all over with a fork and baked them at 400 F until they were browned, which was about 8-10 minutes or so. Removed them from the oven and let them cool before filling with the lemon curd and topping with whipped cream. The above recipe for curd filled about 9 tarts quite generously, so if you are making for a crowd I'd double the amount of curd you are making. Store the tarts in the fridge for a few days-but I doubt that they will last that long.